Fleetwood Mac tours so sporadically, the band would certainly be within its rights to trot out a well-worn greatest hits setlist when it does hit the road. 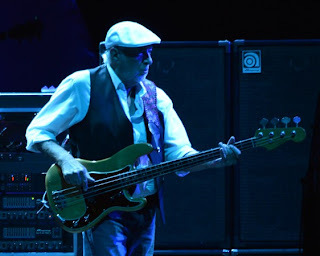 But last night at Quicken Loans Arena, during a show that stretched over two-and-a-half hours, the group—vocalist Stevie Nicks, vocalist/guitarist Lindsey Buckingham, drummer Mick Fleetwood and bassist John McVie, as well as several auxiliary musicians and vocalists—balanced its biggest hits with deeper album tracks and even new songs. The result was a vital, energetic concert that erased any doubts about Fleetwood Mac’s legacy and continued influence. “The Chain” was crisp and menacing, with McVie’s thundering bass and Buckingham’s forceful guitar making the song feel like an encore rather than the set’s second tune. “Gold Dust Woman” also had an ominous vibe; the song turned into a moody psychedelic sprawl during which Nicks unveiled some graceful interpretive dance moves (and, with her gold-colored shawl, resembled an evil villain from a Grimm’s Fairy Tale). The Mirage deep cut “Eyes Of The World” barnstormed forward thanks to Fleetwood’s monstrous drumming, and even a performance of the Nicks solo song “Stand Back,” in all of its ’80s keyboard glory, held its own. True to form, however, the band didn’t just coast on its past. The new song “Sad Angel” (from Fleetwood Mac’s recently released EP, Extended Play) had a throwback jangle-pop vibe, but the performance was fresh and modern; on this song especially, it was clear how Buckingham’s ongoing solo work informs—but doesn’t overpower—Fleetwood Mac. Accordingly, the guitarist also took center stage with an intricate solo acoustic guitar version of “Big Love” and galloped around the stage slashing out a raucous electric solo at the end of a slinky, stretched-out “I’m So Afraid.” At the end of both tunes, his shirt was soaked through with sweat, a reflection of the passion he put into his performance. Mick Fleetwood too was a commanding presence behind his fortress-esque drum kit: Like Father Time with a vendetta, he tossed off intense grimaces and a look of steely concentration throughout. Nicks too was in good form, warming up—especially vocally—as the show progressed. Plus, she was in a chatty, laid-back mood. Before another “new” song, “Without You”—which was actually an older song originally meant for Buckingham-Nicks’ second LP—she told a lengthy, amusing story about the song’s genesis that doubled as the tale of how Fleetwood Mac originally came together. She joked that over the course of the tour, the story had ballooned from a brief missive into something much more rambling, and even asked Buckingham if she was on the right track. (He said she was.) Prior to “Dreams,” she mentioned getting into Cleveland the previous night and being struck by a building lit by red lights (in other words, the Terminal Tower and its Hot In Cleveland promotion), and right before she and Buckingham performed “Landslide,” she said she was “not going to cry” as she dedicated the song. Perhaps because of its pop culture ubiquity, “Landslide” has become Fleetwood Mac’s most iconic song. Last night’s lovely, stripped-down version proved why: In a touching move, the entire crowd sang along softly but audibly throughout the entire song. Perhaps in response, Nicks and Buckingham hooked pinky fingers in solidarity briefly during the performance, the gesture of two old friends acknowledging plenty of shared history. This small affection naturally thrilled the audience, but also subtly reinforced that chemistry is something the band still has in spades. Fleetwood Mac certainly doesn’t have to tour—but the members of the band genuinely appeared to be having a great time onstage and felt like a vital band with plenty left to say. WORLD TURNING and the ever changing Mick Fleetwood drum solo! Fleetwood Mac IS and will ALWAYS be... one of the greatest bands to ever grace a stage.